"Visualizing War" by Alexandra C. Ward, Natalie S. Sherif et al. 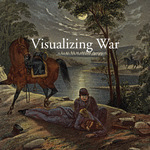 Visualizing War was on exhibition at Schmucker Art Gallery at Gettysburg College, August 29 - September 29, 2012. Ward, Alexandra C.; Sherif, Natalie S.; Egbert, Andrew W.; and Carmichael, Peter S., "Visualizing War" (2012). Schmucker Art Catalogs. 10.